Rebecca Dallet and Michael Screnock. 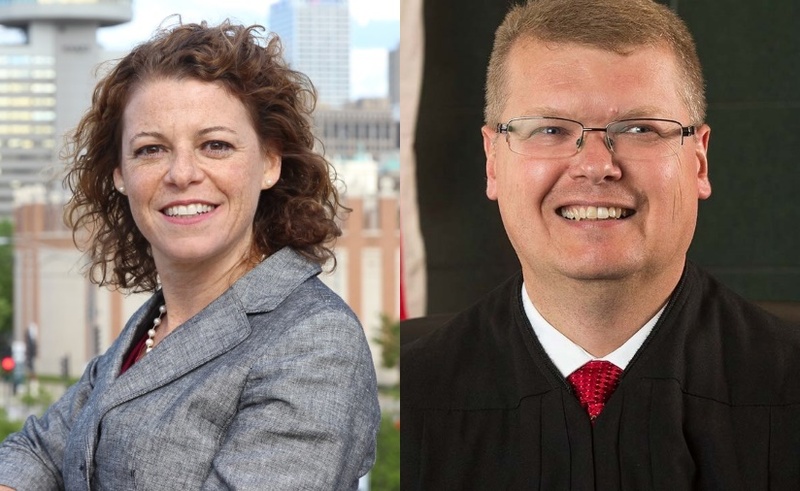 The two candidates facing off in next week’s spring election for a seat on the Wisconsin Supreme Court raised more than $1.2 million combined since the beginning of the year. Campaign finance reports filed by the candidates show the state GOP and longtime Republican donors continued to back candidate Michael Screnock. Meanwhile, unions and traditional Democratic contributors supported candidate Rebecca Dallet. The latest reports showed Screnock, a Sauk County Circuit Court judge, raised about $748,500 and spent about $700,000 since the beginning of the year. The latest campaign finance reports also showed Dallet, a Milwaukee County Circuit Court judge, raised about $520,150 and spent about $496,950 since the beginning of the year. Marianne Lubar, of River Hills, $10,000. Lubar’s husband, Sheldon, is founder and chairman of Lubar & Co., a private investment firm. Vote Dallet April 3, 2018! No more far right wing activist judges backed by sleazy Washington Special Interest groups or lobbyists in Wisconsin! No more bought and paid for corporate hacks or partisan republican stooges in Wisconsin! It’s time to take our state back from these charlatans! Easy realization….Dallet is the only one worthy of support. Based on facts.